Our face mask is made of 100% acrylic, stretchable rib-knit fabric. 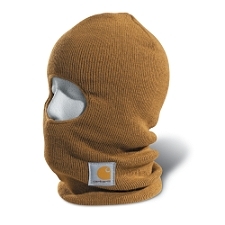 Its lined with a Thinsulate Flex 40g insulation for warmth and features an extra-long neck for added protection. One size fits all. The Carhartt label is sewn on the front.